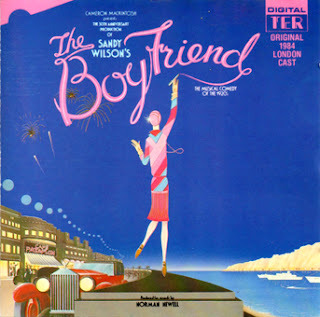 Although the original Broadway cast has Julie Andrews as Polly, I prefer this 1984 London cast recording. I think that Sandy Wilson’s delicious score never sounded better. This Twenties musical comedies spoof began life as a small show but soon its charms turn it into a big hit. For a lover of the 20s like me, this is musical heaven! This may sound like a naïve musical, but it’s a flashback to happier innocent times and songs like “Won’t You Charleston with Me”, “I Could Be Happy with You” and “The Riviera” are an irresistible invitation to dance! … and the cover is simply delicious! Sandy did a sequel to "The Boyfriend" set 10 years later (1930) when the happy endings couples are getting divorces ("Divorce Me Darling"). It's fun but doesn't quite come up to the dazzle of "The Boyfriend". I really enjoy DIVORCE ME, DARLING, specially the Chichester Festival Cast recording featuring Ruthie Henshall, But I prefer THE BOY FRIEND.